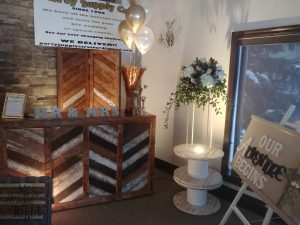 MORE NEW ONE OF A KIND PRODUCTS 2019/20 – Party Supply Co. 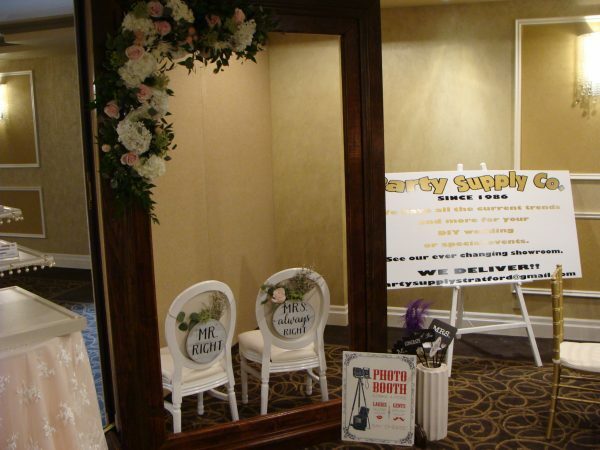 Happy to partner with you for the DIY wedding of your dreams! 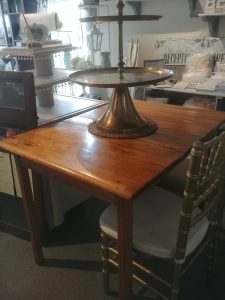 Early American Pine Table Spool dbl. stacked with 30” Wrought Iron Stand $44 ea. (set) Does not include floral. 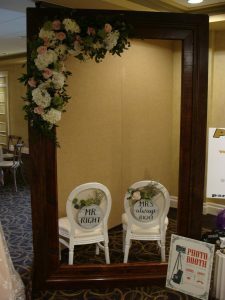 Makes a beautiful reception area hilight or use 2 of these gorgeous stands at either end of your head table. Now with rope accents! 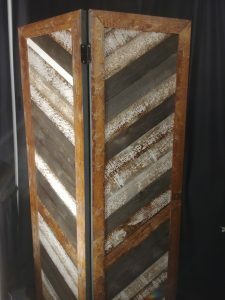 Complete Rustic White Dbl. 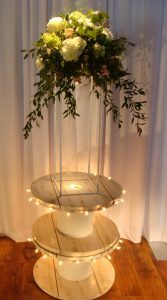 Stack Table Spool with inset light and 30″ Wrought Iron Stand $55 ea. 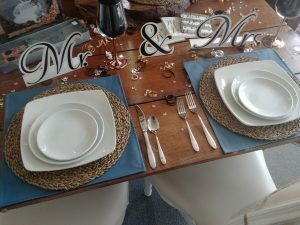 ( 3 piece set) Does not include floral or string lighting. 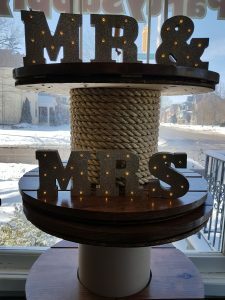 Use Table Spools in your reception area as tables, or as decor item as shown. 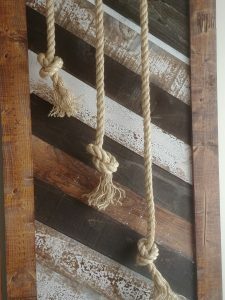 New rope accessory core wrap…. 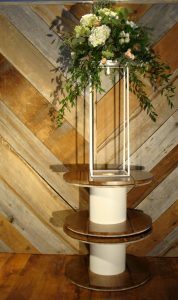 Wrought Iron Stand 30″H x 10″ x 10″ for floral table centerpiece. 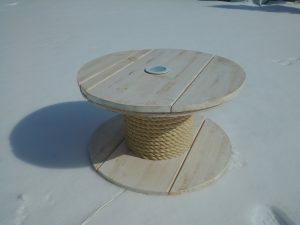 Table Spools designed to hold mini lights strings and assembles in minutes. Photo Frame $150. plus $40 delivery, set up and pick up in Stratford. Includes 1/2 dozen props for those who love to ham it up. This very large item can be disassembled and snap and clicked back together. Easily fits into an SUV or Minivan. 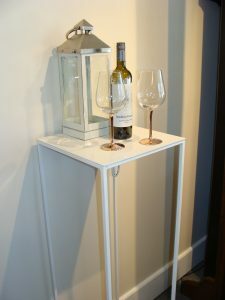 Large 48″H x 14″ x 14″ Wrought Iron Stand Cruiser/Cocktail Table/Floral $22 ea. 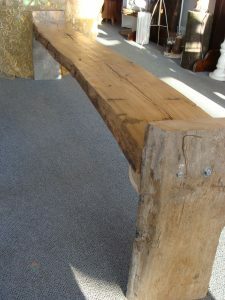 Wooden Bench sourced from an Ash Tree Circa 1600’s when pirates sailed the seas. This amazing ash tree was felled and then became a log home built in the late 1800’s. It was rescued and came into our possession recently. We decided to make objects of interest from this ancient 17th century Ash for everyone to continue to enjoy and they are now available! 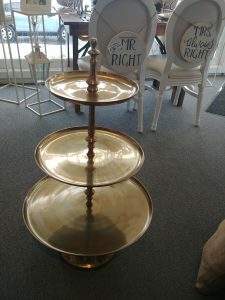 This 3 Tier Brass Stand Statement Piece for your Sweets and Treats $65. Stunning Chevron Back Drop complete set 3 dbl panels $285. 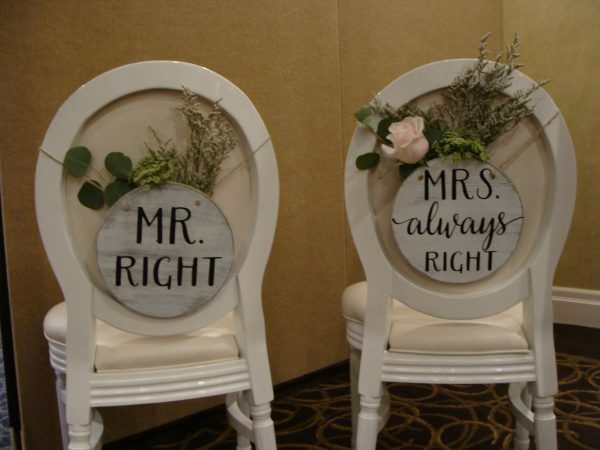 Can be rented separately for $95 ea. Vintage Sweetheart table circa 1930’s can be used for cake table, gift table or sweets and treats. $39. 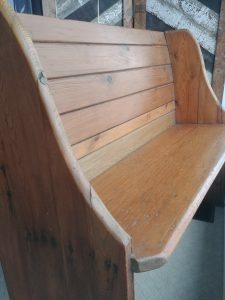 Turn of the Century Deacons Bench to complete your sweetheart set up as seen below! $62. 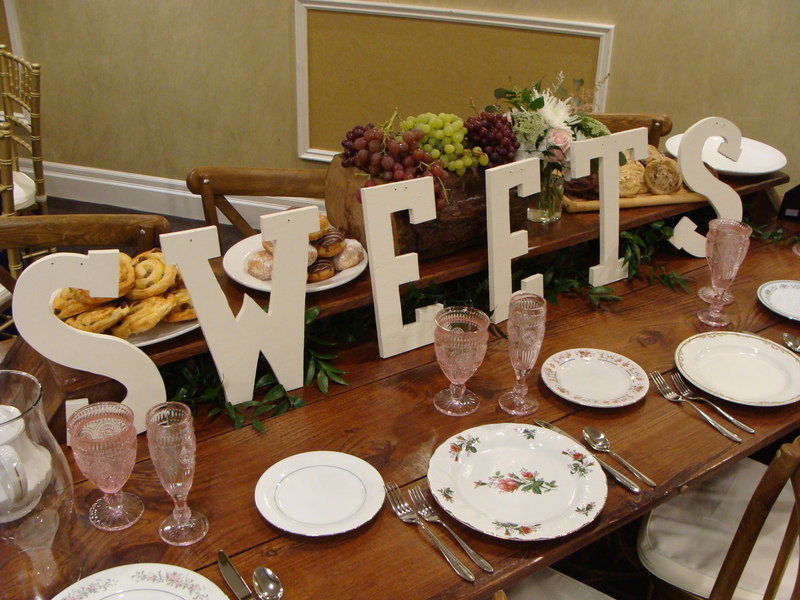 Deacons Bench can be used as a photo bench, sweetheart table seating or a photo prop or seat. 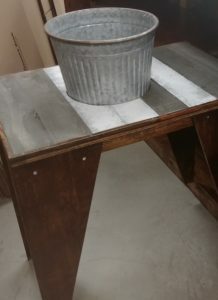 Below image shows “backside” featuring 2 full shelves and a vintage bucket for ice. Below the ice bucket is space for a waste basket/bucket. 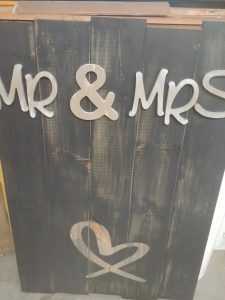 **New MR and MRS Signage with hints of golden natural wood coloring. $35. A touch of class and a touch of vintage for the perfect combo! 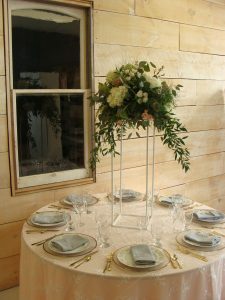 Stand it up in front of your head table or hang it up. 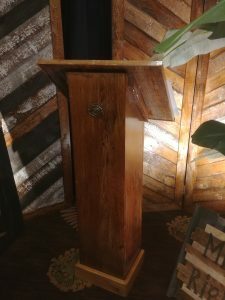 ** Podium in Early American Pine** show special $39. 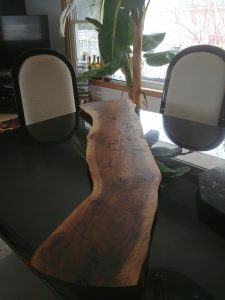 Black Walnut Charcutterie Board $48. Use it for your special sweets and treats, relishes, desserts, any any other items you wish to hi light. Another new sign!! Thank You so much with Chalk Board space for Bride and Groom personalization. $22. 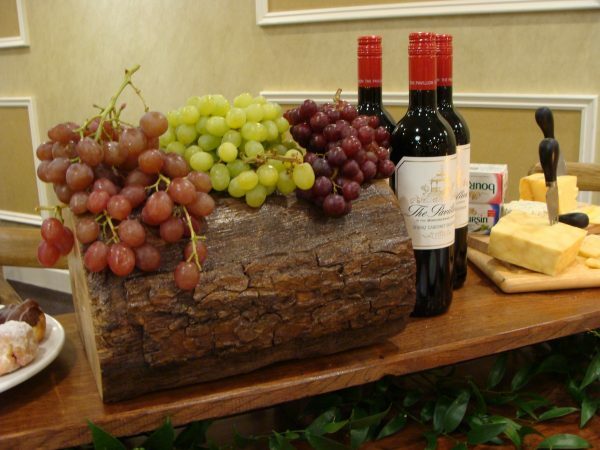 Stands on it’s own and can be used on a Gift Table or in an entrance way as guests are leaving. AND ….WELL, THE LIST JUST KEEPS GROWING. 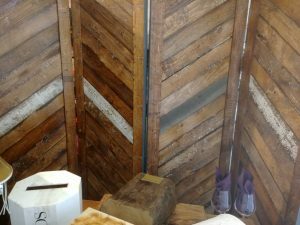 Images to come very very soon…… STAY TUNED for our new BACKDROPS! ……………Cityscapes, Landscapes, Streetscapes??? 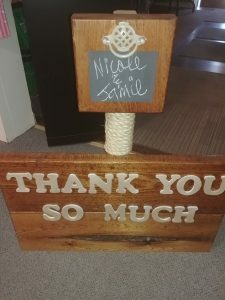 Check our new items out in person at Party Supply, Ontario Street, Stratford. We are on your way! Ample Parking. 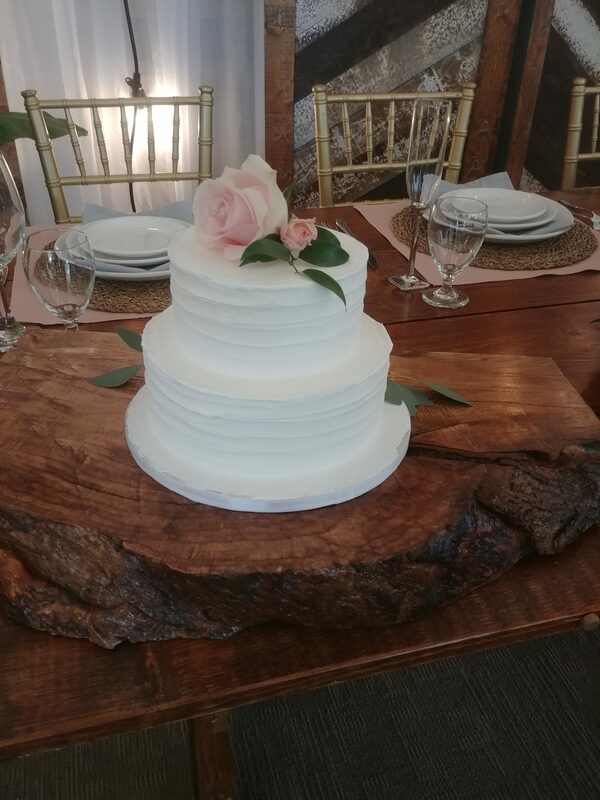 WE DO OUR BEST TO MAKE SURE YOU CAN MOVE OUR AMAZING RENTAL ITEMS TO AND FROM YOUR EVENT WITHOUT DAMAGES. YOU ARE RESPONSIBLE FOR ALL ITEMS YOU RENT AND THEREFORE ANY DAMAGES ARE SUBJECT TO REPAIR COSTS AND DEPRECIATION COSTS DUE TO CARELESSNESS. Please make sure you have responsible people to move your/our rental items.